“Silent” protestors with their mouths taped shut confronted Sacramento Mayor Kevin Johnson and corporate education proponent Michelle Rhee as they entered a carefully promoted and controlled discussion about education issues at the Tsakopoulos Library Galleria, 828 I St, in Sacramento on Wednesday, January 25. Demonstrators held a news briefing with local media outlets. 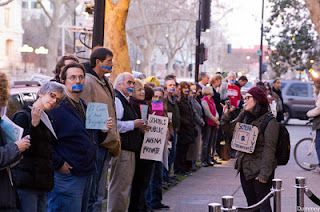 The Sacramento Bee did not cover the demonstration. This protests occurs as Wall Street corporations and foundations are funding not only the privatization of education. The protestors set up a ‘gauntlet” of protestors with their mouths taped shut –something Rhee admitted to doing to her noisy students when she was a teacher. She later said some of the students were hurt when they removed the tape. The “Town Hall” organized by Rhee and Johnson gained positive press coverage on local news channels. They covered Rhee’s views and the advocacy group without describing her connections to right wing groups. Why do many reporters not report on the realities of the corporate sponsorship of one group of “school reformers”? are profiting from these public institutions is a growing scandal. Educational historian Diane Ravitch will make a presentation in Sacramento on Jan. 20, 2012 sponsored by local CTA affiliates- that is good. The public needs this conversation and teachers need this support. The Bee story on Jan 12 unfortunately uses a misleading headline- Testing Critic to address teachers. The issue is testing and more. And, the public needs to consider what is happening to their schools- not only teachers. The Bee article by Melody Gutierrez is reasonable, while the general reporting on education in national newspapers, magazines and television leaves much to be desired. Ravitch’s book and her presentations will offer a small but important counter story. Why do many reporters not report on the realities of school change? They too often rely upon the wisdom of selected “spokespersons” and other elites. They have been sold a framework of a corporate view of accountability. Corporate sponsored networks and think tanks such as the the Thomas B. Fordham Institute, the Broad Foundation, the Bradley Foundation, the Pacific Research Institute, and the Olin Foundation provide “experts” prepared to give an opinion on short notice to meet a reporters deadline. Most reporters assume that these notables are telling the truth when in fact they are promoting a particular propaganda such as in the film “Waiting for Superman”. Who do they not talk with? They fail to interview experienced teachers and professionals who have worked for decades to improve the quality of inner city schools. If the national movement to "reform" public education through vouchers, charters and privatization has a laboratory, it is Florida. It was one of the first states to undertake a program of "virtual schools" — charters operated online, with teachers instructing students over the Internet — as well as one of the first to use vouchers to channel taxpayer money to charter schools run by for-profits. Lamenting this series of defeats, Patricia Levesque, a top adviser to former Governor Jeb Bush, spoke to fellow reformers at a retreat in October 2010. Levesque noted that reform efforts had failed because the opposition had time to organize. Next year, Levesque advised, reformers should "spread" the unions thin "by playing offense" with decoy legislation. Levesque said she planned to sponsor a series of statewide reforms, like allowing taxpayer dollars to go to religious schools by overturning the so-called Blaine Amendment, "even if it doesn't pass…to keep them busy on that front." She also advised paycheck protection, a unionbusting scheme, as well as a state-provided insurance program to encourage teachers to leave the union and a transparency law to force teachers unions to show additional information to the public. Needling the labor unions with all these bills, Levesque said, allows certain charter bills to fly "under the radar." See this and other posts about how California teachers are "evaluated."